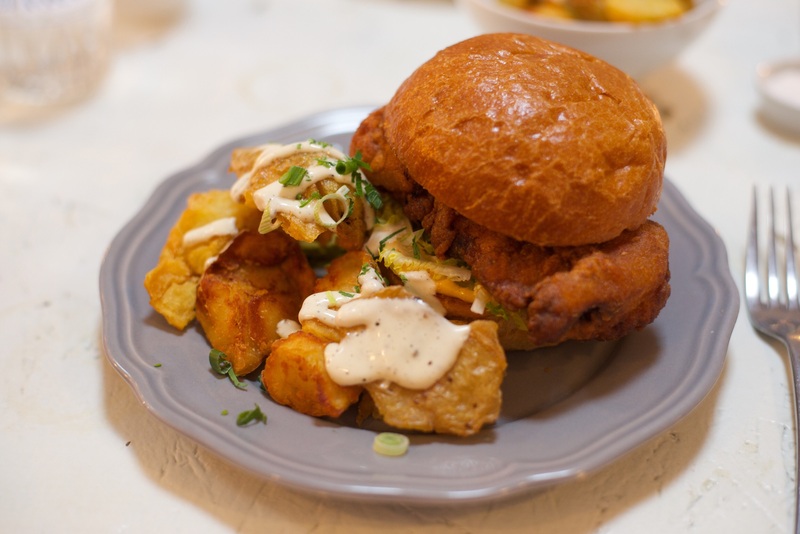 You know when food lingers long in the memory, well this was me over a certain fried chicken roll from London based Rita’s, yeah the one I’d devoured at Leeds feast. Knowing I was to spend Saturday doing fun stuff in London, I just wanted to visit Rita’s properly and have another one!! 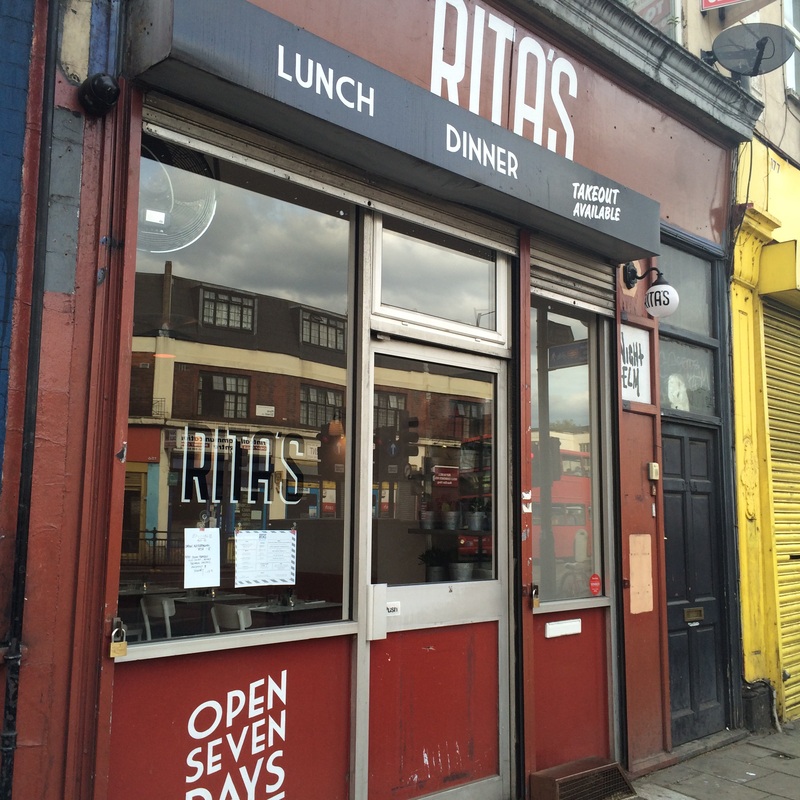 For those of you who may not know of Rita’s, it’s a restaurant serving American inspired food in London Fields, with the closest tube Bethnal Green it was a bit of a trek for the other half, who was venturing in especially, it ended up taken nearly two hours to get there. However, I was hoping it would be more than worth his efforts, only time would tell. We like dinner early, so got there for 6pm. From the outside it reminded me a bit of a takeaway and hardly stood out from the premises either side. 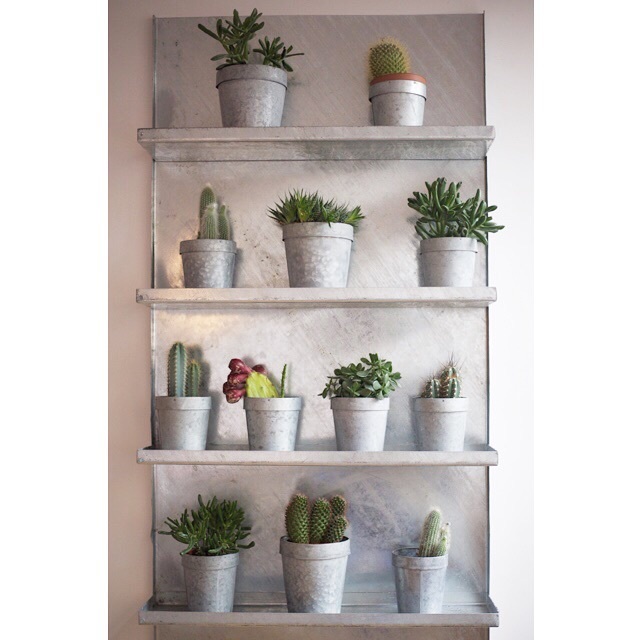 Any preconceived doubts there may’ve been from our first impressions of the outside soon started to disappear when we walked inside as you get a different vibe altogether, its interior is light with white walls, pink comfy seating and light wooden floors. The menu is short and concise with a handful of starters, and similar with mains, sides and the odd special added for good measure. Knowing we were coming for dinner, I’d looked on the menu and had a feeling that the other half would go for steak, while I was ALWAYS going to reacquaint myself with the chicken roll once more! They have a thing about cocktails at Rita’s, from a list of six or so ordered one of their frozen hibiscus margheritas, that we missed out on at Leeds feast. I on the other hand spotted a watermelon aperol spritz on the menu, it’d been a lovely warm sunny day and it’s such a great drink I thought ‘why not? 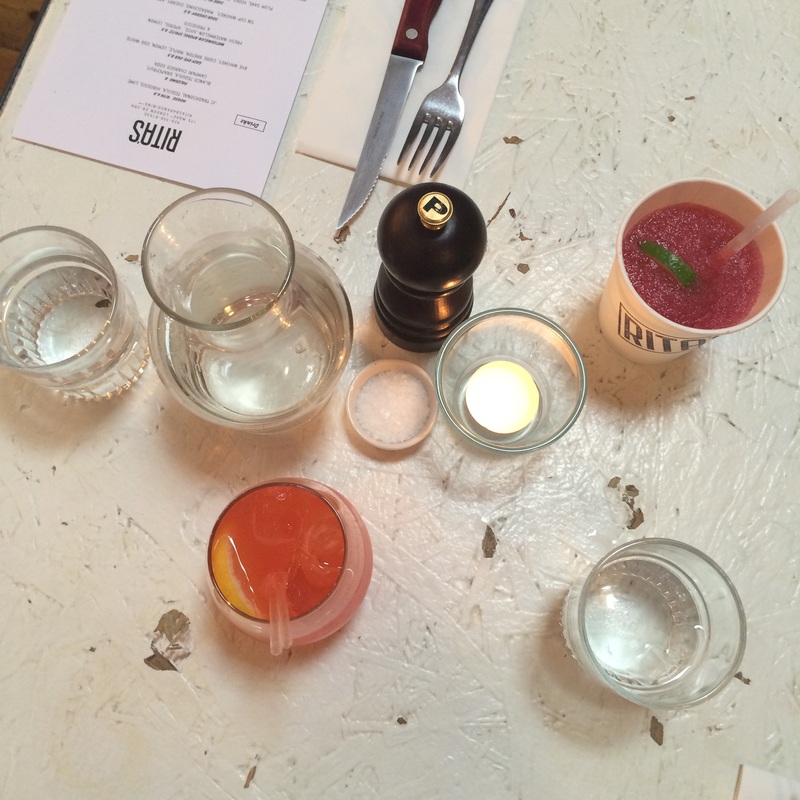 !’ They both were really hit the spot – the margherita was strong and punchy, whilst the aperol spritz was refreshing and its slight bitterness was tamed by the watermelon. Definitely one to remember for the warm summer months, if we get any that is or even if we don’t!! Tucking into his steak there was pretty much silence across the table, apart from the sound of cutlery doing its job. 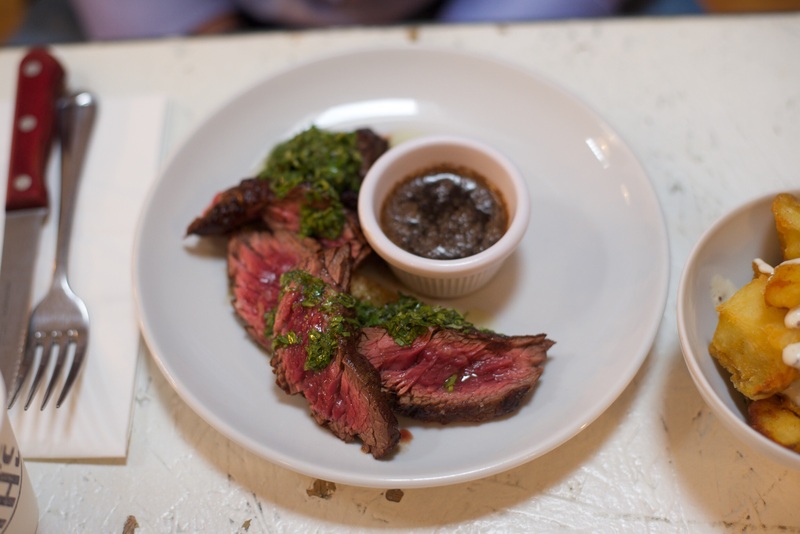 I tried a small bit – it was a beautiful piece of meat, had great flavour and with the very green chimichurri lots of herbs and garlic, it was a great pairing. 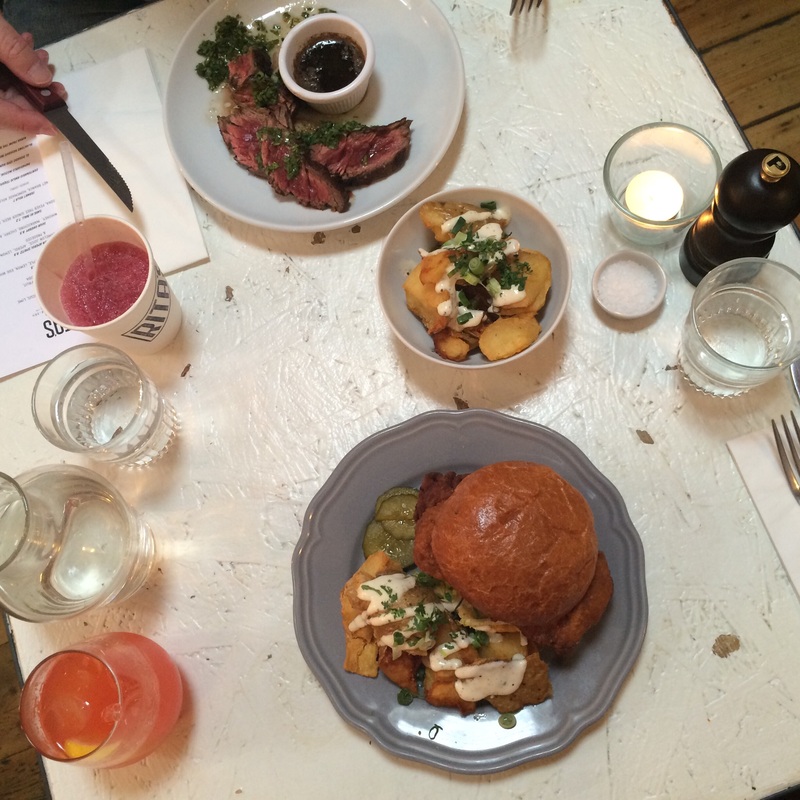 The crispy potatoes were pretty damn good too, we both could’ve gone through shed loads of them. My chicken roll probably wasn’t as massive as the one I’d gushed over at Leeds feast, which was huge!! 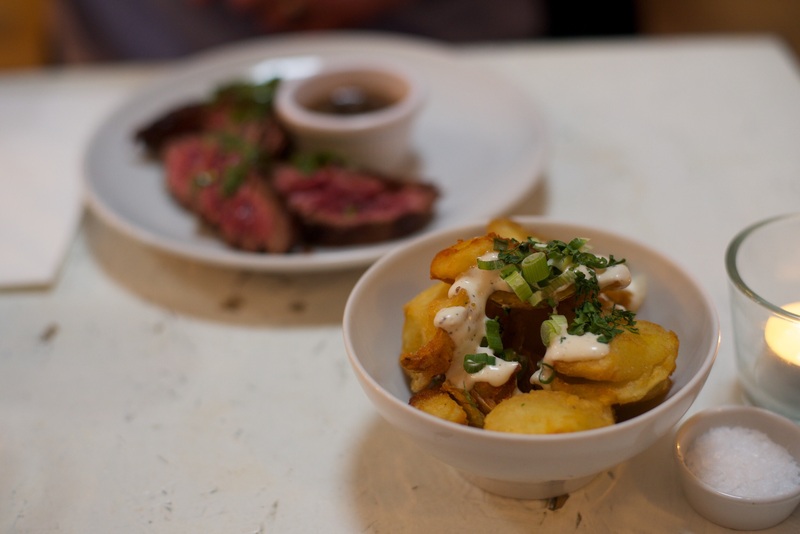 However, it tasted just as good – the crust golden and crisp, the meat itself so juicy and with those potatoes, a few slices of pickles – sharp but not enough to make me wince. A definite WINNER!!!! Skipping the starters, for a change I opted for a dessert especially when I read the word beignet – I was immediately sold! 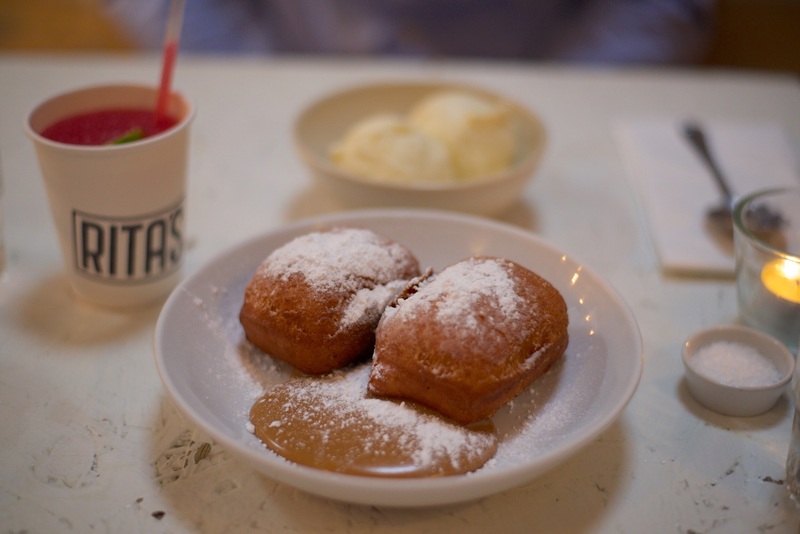 After a quick recommendation from our server reaffirming my choice, I was brought over two glorious mounds of pimped up sophisticated doughnut – crisp and deliciously sweet without giving me tooth ache on the outside, whilst the inside was warm, light and soft. Partnered with a generous amount of dulce de leche it could’ve been too much sweet for me, but instead was far more measured and the sprinkling of icing sugar gave it a little sweet pick-me-up. It may’ve taken almost an age to get there, but even the other half said it was worth it, even for the steak alone!! Loved it – it looks nothing from the street, but is completely different once inside – light, bright, friendly staff, top-notch food and cocktails! !